"I thought you might like this rather rare find I came across the other day in Chilean Patagonia," writes Roxanne Schinas in sharing her photo of this remarkable insect. "I was walking on the seemingly sterile surface of a glacier when I noticed a prehistoric-looking creature floating in a puddle of meltwater, and at first assumed it must have been dropped by a bird. "Actually this is a creature known as the Patagonian dragon, a very primitive insect which spends its entire life within the glaciers of the Andean Southern Icefield: the only wingless member of the stonefly family, it has high concentrations of glycerol (antifreeze) in its blood, and feeds entirely on the particles of algae growing in minute crevices in the ice. Since this part of the world is inaccessible and uninhabited these insects are very understudied, and I was very lucky to come across one which had ventured out of the ice." The first insects evolved almost 500 million years ago, so seeing a type that's old even by insect standards—and survives in and on glaciers—is amazing. Who needs mythological animals when the planet is filled with so many astounding real ones? Many thanks, Roxanne! “Three's a crowd," writes Karen Blackwood of Eagle Eye Safaris in sharing her photo with us from Kruger National Park in South Africa. "As prey animals, zebra are always wary at waterholes. They can't see much with their heads down, nor can they smell predators while drinking. Slaking their thirst is a leap of faith, but there's always one keeping watch, helping to keep the herd-mates safe. Please take a look in full screen for details you might miss at a glance, and we hope you enjoy them as much as we did!" Anyone else seen a zebra in the wild? Thanks, Karen. "Yesterday I found a sapling sassafras with at least a dozen spicebush swallowtail (Papilio troilus) caterpillars on it in all different instars [stages of development]," writes insect expert David Moskowitz in sharing these photos with us from Cape May, New Jersey. "The false eyes of these caterpillars change dramatically between instars and are fantastic. Here they are from what is probably the 2nd instar through the 5th instar. Enjoy!" Have you ever seen this type of caterpillar? Many thanks to David. You can find more of his insect photos, expertise and enthusiasm at https://www.facebook.com/BugAddictionConfessionsOfABugAddi…/. “Mountain goats. Beartooth Plateau, Wyoming," writes Jay Anderson in sharing these three photos with us. "Part of the greater Yellowstone ecosystem.” These amazingly sure-footed climbers and leapers (able to soar up to 12 feet in a single bound) are not actually goats; they're part of a family that includes gazelles and antelopes. They're able to maneuver on steep slopes in part because their cloven hooves have inner gripping pads and sharp, curved, anti-slipping dewclaws and can be spread apart for traction. 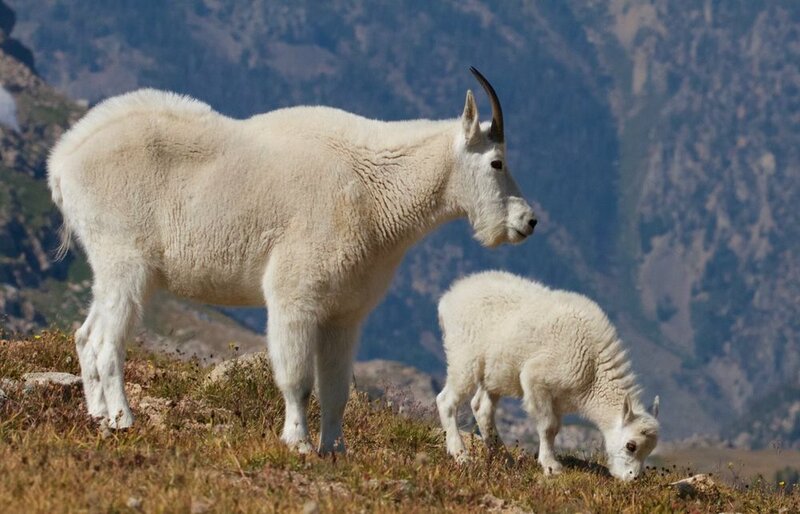 The age of a mountain goat can be determined by counting the growth rings on their horns, which they don't shed. Many thanks to Jay for his photos. Have you ever seen or photographed a mountain goat?